It’s time for another Cute Outfit Ideas of the Week! Today’s feature is dedicated to one of my favorites – the floral blouse. It’s the perfect piece for spring fashion and it can add elegance and a pop of color to any outfit. You can wear a floral blouse with jeans, shorts or a skirt. You can create an edgy look by wearing it under a spring time leather jacket, or go super feminine and wear it with a skirt and heels. Enjoy these three different looks and be sure to let me know which one is your favorite! Pair a floral top with white jeans for a pretty spring look. I love mixing mint with black. It’s such a classy look! If you wanted to add more color, you could wear a pair of pink or peach earrings. For a more casual look, switch out the strappy heels for sandals. I love this look for work. A classic pencil skirt gives this a bit of a retro feel to it. You can bring out the gorgeous pink colors in the floral top by pairing it with a colorful handbag. This outfit is simple, yet classic. Here’s a more casual look that’s perfect for the weekend. 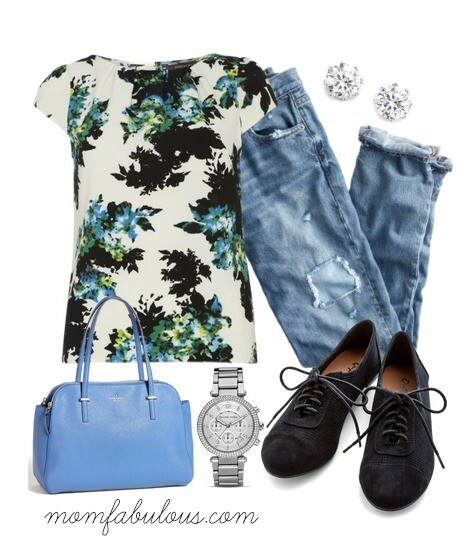 Pair a floral tee with distressed boyfriend jeans and oxford style shoes. You’ll be ready to run errands or chase the kids around at the park. I am not normally a floral person but I love these looks especially the last one, that Dorothy Perkins shirt is fabulous! Isn’t that shirt great?! You can dress it up or down. I love it. I’ve been embracing more of the floral fabrics more and more. The first with the white pants & the last with the boyfriend jeans. Love those two! I actually don’t even own a floral blouse. (What is wrong with me?) Actually I just never thought they were my style or looked good on me. But your awesome looks are certainly inspiring me to give them another try! So many cute outfits. LOVE the one with the red bag.